In Brief: Follow hill trails through shaded valleys on the way up to the Great Wall on the west side of Jiankou. 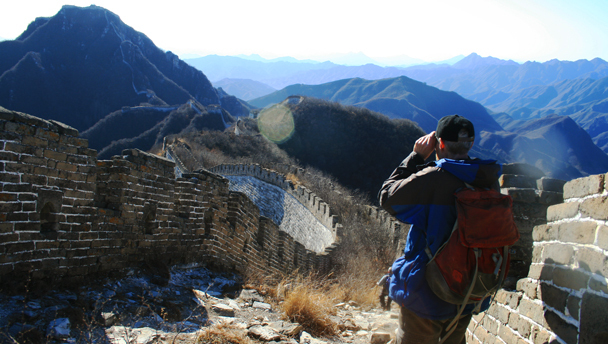 A hiker using binoculars to get a closer look at a stretch of Jiankou's 'Big West' Great Wall. approx. 3 hours start to finish over 6km. Could be icy. If there’s been snow in the weeks before the hike the trails might be icy. If it seems like they’d be dangerously icy we’d change the plan for the hike. This hike is a shortened version of our Nine-Eyes Tower trail. We’ll see a lot of the same scenery, but we’ll skip the super-tough scramble up to the Nine-Eyes Tower. Starting off at one of the smaller villages in the Jiankou area, we’ll warm up with a slow climb up into the hills, following little paths that the villagers use to get to the fields where they grow their corn and chestnuts. The trail takes us up into a forested area, and through pastures that were used to farm cows. The stonewall cattle pens are still in evidence, although hidden in the undergrowth. The long grass is a good sign that there haven’t been any cows in here for quite a while! Passing old stone walls and terraces, the trail starts to get steep again as the Great Wall comes into view on the ridgeline above. At the top of the trail is Er Dao Bian Tower, the start of the Nine-Eyes tower loop. Er Dao Bian roughly translates as ‘Two Roads On Each Side,’ and at this point in the hike we’ll be at approximately 900m above sea level. From here, we’ll follow the wall south towards the Chinese Knot section, passing around and over ten towers. The first four towers are not in the best condition, and the trail we take sometimes skirts around sections that are too steep or too broken to walk on, and it’s in this part where we’ll find the trickiest descent of the hike. After a while we’ll be back on to solid footing, and we’ll get excellent views of the Big West Wall: solid and uncommonly tall foundations made of huge carved rocks topped with Ming Dynasty (1368–1644) brickwork and towers. At the tenth tower, we’ll leave the wall and follow a trail back to Xizhazi Village – steep and slippery at the beginning, flattening out as we pass through a lovely forested area and the villagers’ orchards and fields. There are some tricky ups and downs on quite loose footing that will not be enjoyable if you don’t like heights or don’t have shoes with good grip. The trail could be brushy and scratchy in places. 25+ photos from our hike on the Big West section of the Jiankou Great Wall up in Huairou District, when Beijing welcomed its first snow. Nineteen photos from a hike along the Great Wall on the west side of Jiankou. Sixteen photos from a hike on the west side of Jiankou. Nineteen photos from Jiankou’s ‘Big West’ Wall on a beautiful September day. Photos from our 2015 Earth Day clean up hike at the Jiankou Great Wall. 30+ photos from a cold day out on the Great Wall on the west side of Jiankou.